Working with architects Isherwood McCann, Wilson Bowden designed and built two client-specified distribution warehouses for healthcare supply chain solutions company UDG. 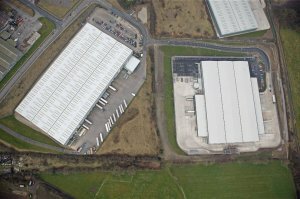 These units, one totalling 200,000 sq ft and the other 184,000 sq ft, are located at Amber Park near Junction 28 of the M1 motorway and were completed in 2004. Work on this development included the relocation of a great crested newt colony, a species protected by law.